Being totally honest, the packaging often attracts me just as much as the projects themselves, and is often just as original. The DIY Instant Comfort Boxes by Kim Welling are a case in point; although I also have a huge soft spot for Pupurin’s Little Kitty Kit. Those with a mildly sick sense of humour (who me?) 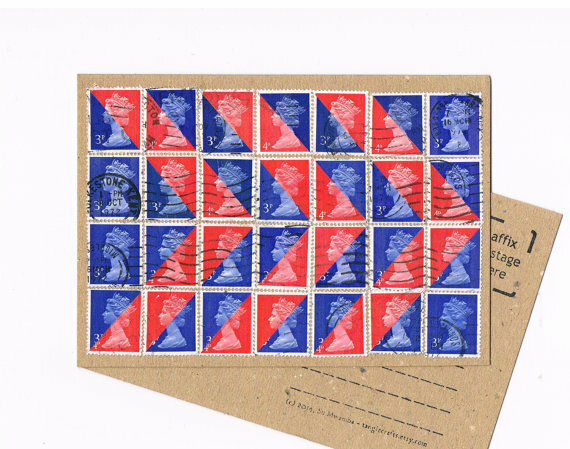 may enjoy the 1/2 splat kit (must click to discover what this is, although the title is quite accurate! ); while any embroiderers looking for a creative challenge should take a look at the wonderful Crafting Shelves kit from This Tiny Existence. 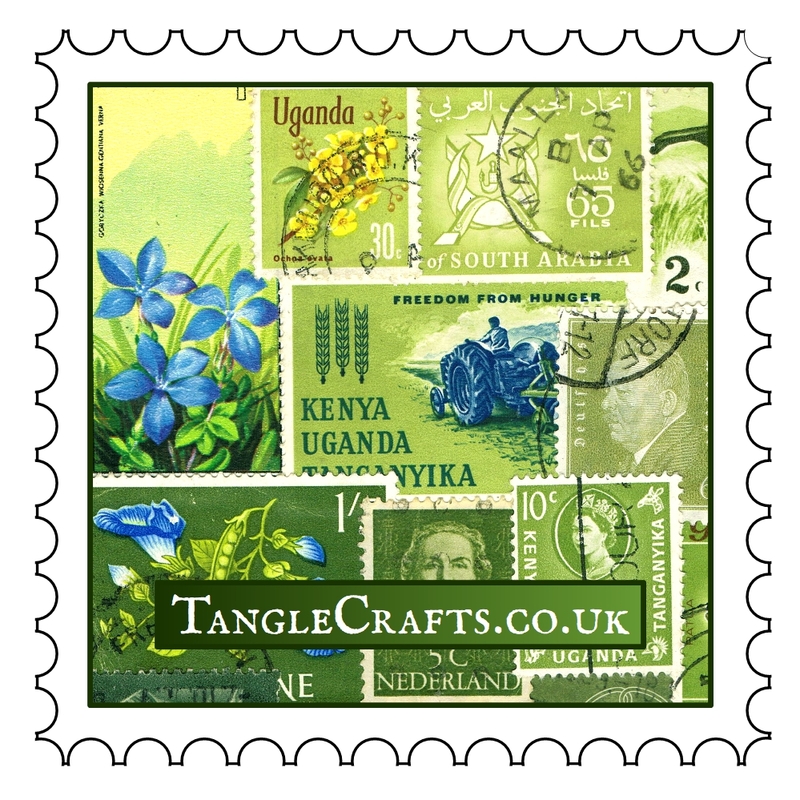 Well, take a look at the whole treasury: there are all kinds of craft kits from all kinds of crafters so hopefully something will inspire you! Besides that, I have a freshly acquired small stash of funky fabrics and wool felts that I am itching to play with, and lots of ideas in mind. I can’t resist all the patterns, and the combinations of colours; and after my stocking project, I really got a feel for having a needle in my hand again. My mother has claimed the unenviable task of teaching me to use a sewing machine, but this will be another slow-burner due to not living in the same city, not to mention my reluctance mainly concerning the noise of the thing. I really just prefer having space to hear my own thoughts, but then again, I’m generally very good at tuning out sounds from the real world that attempt to permeate my inner world (how dare they! ), so maybe I can tune out the sewing machine, too… Again, I will keep you posted. So, how about you? Any crafty plans and/or resolutions for the new year? Please share & inspire/motivate the rest of us! The new D.I.Y. Weaving Club is up and running! 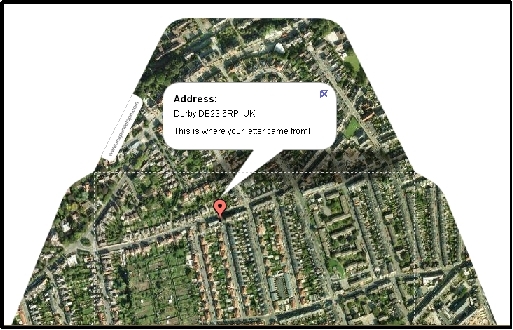 Taking a ‘kind-of’ break while I moved house enabled me to think about how I could improve the formula for the D.I.Y. Weaving Club. With the first batch of 3 month subscriptions just come to an end, this seemed like the perfect time to make the change. 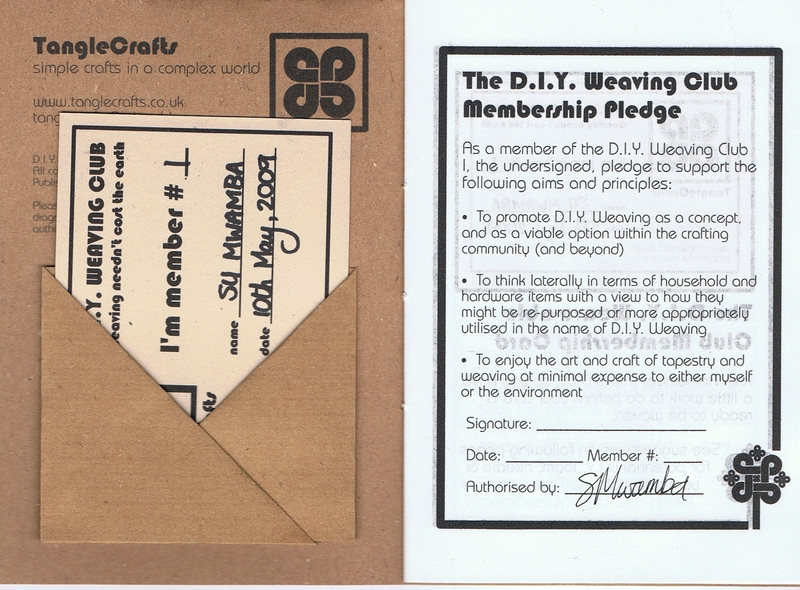 a one-off Basic Membership Pack, which includes a weave-able Membership Card & an exclusive Membership Book. This gives you lifelong membership to the D.I.Y. Weaving Club, with email updates. 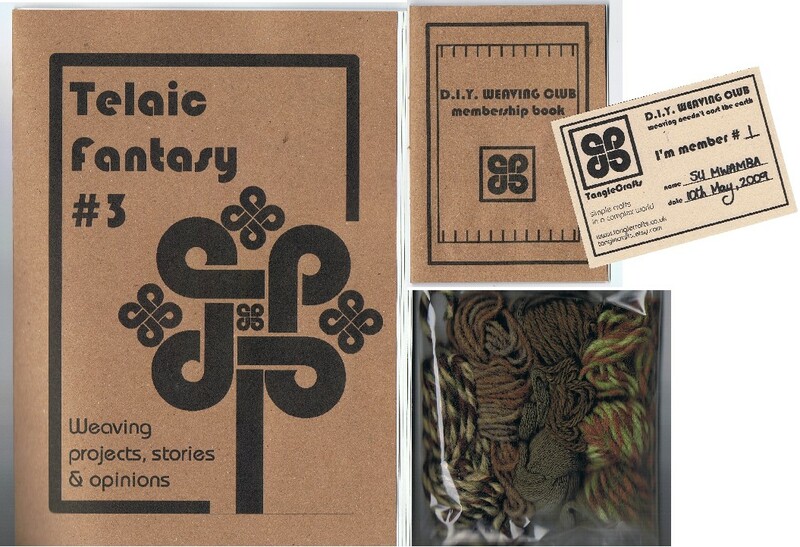 a Membership Pack which includes card & book (as above), plus an issue of Telaic Fantasy zine with accessories for a D.I.Y. weaving project, and a randomly selected mixed yarn pack. if you don’t want to join the club but would like the latest meanderings & projects from ‘Telaic Fantasy’, you can buy any of the zines alone. TF has grown quite dramatically! It is now half-size (A5) rather than quarter, and includes at least one D.I.Y. weaving project inside (the old D.I.Y. club had separate kit & zine, but I decided integration was the way forward), plus random accessories. Extra bits have been added to TF1 & TF2 so they are more chock-full than ever. Want to know more? Check out my Etsy Store! You’ll find detailed info on the contents of each Membership Pack & zine. New zines and Membership Packs will be added over the next few months, possibly at a slightly irregular schedule, but there’s definitely more to come, so please check back! 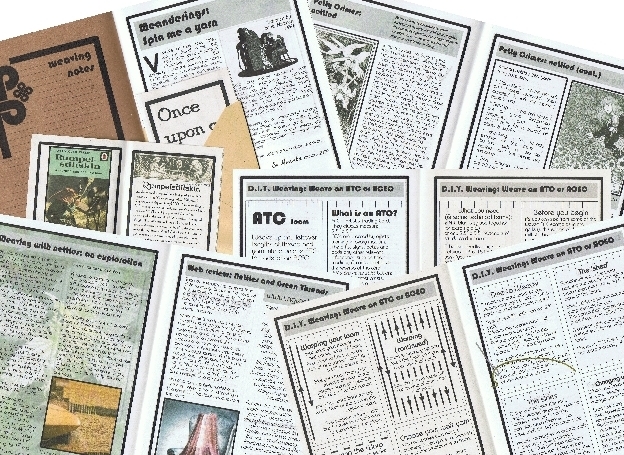 Posted on May 15, 2009 June 10, 2009 Categories DIY Club, Kits, Ordering, Packaging, Tapestry weaving, Weaving, ZineTags club, DIY Weaving, tapestry, Weaving, ZineLeave a comment on The new D.I.Y. Weaving Club is up and running! 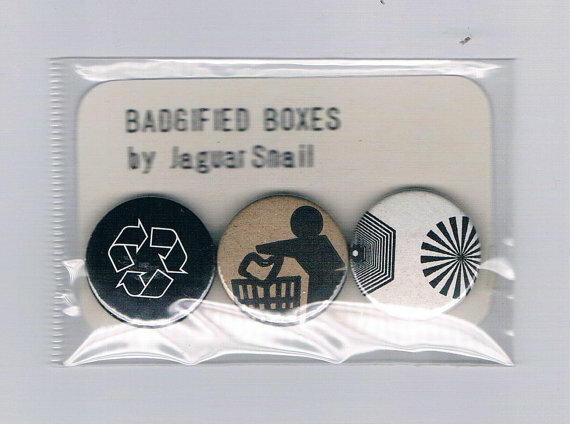 If you’ve bought any of my kits or zines in the past, you’ll know that I use recycled paper for all my packaging and booklets. To be honest, as well as the ecological sense of this, I just prefer the aesthetics of recycled papers – yes, even that grey-ish almost newsprint-like stuff. Stark white paper just looks wrong to me. So, back to the grey-ish, newsprint-like stuff. For kit packaging and booklet covers I use brown kraft paper, but I always think this is a bit dark to print a whole bunch of text on – so the inners are always printed on the grey stuff. Until now…! I picked up what looked, to all intents & purposes, my usual ream of recycled paper, but as soon as I opened the package I could see it had been ‘upgraded’ to a much whiter finish. I didn’t mind too much, at first. I was still finishing up the old paper when I started printing Telaic Fantasy #3, and I actually quite liked the fact that (by accident rather than design) the first print run has a random mix off off-white & whiter pages. I noticed the colour sections appear much brighter on the whiter pages (logic should have led me to expect this), and probably ‘truer’, too, so I reasoned that maybe the whiter paper wasn’t really so bad. Onto the next project… Having run out of my old batch of paper entirely, I started on the new. I saw straight away that there seemed to be much more bleed-through of colour to the reverse of a page than with the greyer paper. It’s the same weight (80gsm), but clearly a different density, or absorption rate, or something. Anyway, I have printed some double-sided stuff, and am really not happy with how much of the next page’s text shows through. In the meantime, I can’t afford not to continue printing on the whiter recycled paper I inadvertently bought :-(. But if the sugar paper works, I will probably keep the white paper to use just for test runs & folding samples, instead.